The typical US consumer walks around with a powerful computer in a pocket or purse. Slightly less powerful computers worn on the body still don’t have a compelling use case for most consumers. 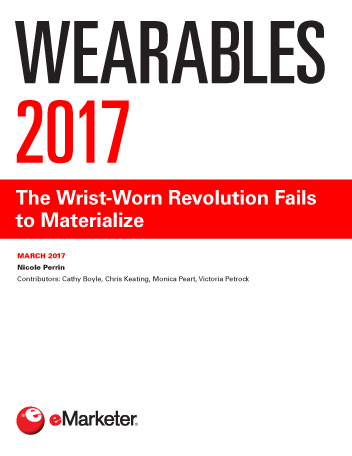 eMarketer estimates that just under 16% of US adults regularly used a wearable device in 2016. More than 44 million adults in the US will use a wearable device at least once per month in 2017, eMarketer estimates, an increase of 12.6% over last year. eMarketer has significantly revised its estimates of wearable usage downward for the entire forecast period, due to the Apple Watch’s failure to generate mass appeal. By 2020, only around one in five US adults—54.9 million—will use a wearable device on a monthly basis. Fitness bands and health trackers, rather than smart watches, continue to be the leading wearables in use in the US. Marketers are interested in innovative wearables-based campaigns as well as basic notifications, but don’t see the technology in place yet to unlock wearables’ full potential for brands. "The US wearable device audience grew by nearly 25% in 2016, but that represented a significant downgrade to earlier expectations. The Apple Watch has not revolutionized the wearables market, and users continue to focus more on fitness bands and health trackers rather than more sophisticated smart watches."